Times of the Islands – Postcard Mania! Old picture postcards from the dawn of the postcard-collecting “craze” are often under-appreciated but valuable historical documents. Those that bear personal messages in addition to period photos are doubly important. The following story by deltiologist (one who collects and studies postcards) Jeffrey Dodge is a case in point. The scenes on the postcard examples below can now be securely dated from the hand-written text. The Harriotts were a prominent and prosperous family in the Turks Islands with strong ties to Bermuda. One can only wonder what was the relationship between Lillian Harriott of Grand Turk and Thorkild Hansen of Copenhagen, Denmark. This is the fourth postcard Lillian Harriott sent to Denmark in April 1906. In 1870, unadorned (without images) postcards were introduced in Great Britain by the post office. They were not a big success. Although postcards with images on them were first introduced in France in 1870, it was not until the late 1880s or early 1890s that Great Britain began producing picture postcards. Early images were of city or countryside views and apparently these were not initially very popular, but that was soon to change. In 1902, the British Post Office permitted both the message and address to be written on the divided back or reverse side of the postcard for the first time. Prior to that, only the address could be written on the back and any message had to be written below or beside the image on the front. It was not until 1907 that the United States authorized the divided back postcard where both the address and message could be written. With the advent of these changes and the presence of more images or pictures that interested the general public, the postcard collecting craze began. In the U.S., the so-called Golden Era of postcard collecting was between 1907 and 1913. For example, in the U.S. alone, over one billion cards were mailed in 1913! Keep in mind that not all postcards purchased were mailed—many were bought as a keepsake or souvenir of a vacation, place visited or just an interesting subject. The postcard mania was not limited to Great Britain, the Continent or the U.S.A. Postcard collecting was also popular on Grand Turk Island. There are a series of 1905 and 1906 picture postcards that were traded between two young sisters on Grand Turk and a young man in Denmark. Lillian Alice Susan Harriott and her sister Gertrude collected and traded postcards during the period 1905–1906. There are seven known examples of postcards that Lillian mailed to or traded with Thorkild Hansen of Denmark. Unfortunately, the copies of six of the seven known postcards traded between Lillian and Mr. Hansen are poor quality photocopies. However, the messages Lillian wrote on these seven postcards are most insightful. There are 15 different examples in this group of postcards that were published by the same entity and printed by the same company. The three postcards pictured here are from this group. All 15 postcards in this group show a border at the bottom, the same title format on the front and the same layout of the back. Interestingly, Lillian chooses to write her message on the front of these postcards even though they have a divided back designed so that a message and the address could be written there. It is possible she did this because these postcards went via New York and the divided back postcard was not permitted by the U.S. postal system until 1907. This is the second postcard sent by Lillian Harriott. The postcard numbered (2) was likely the second in the group of five postcards Lillian mentions in the Govt. Wharf & Warehouse card. Of interest is the statement that they “belong to our new set of postcards.” This might suggest that the Harriott family had something to do with producing them. It would be fascinating to know more about the life and times of the Harriotts. In 1906 Lillian was 14 years old and her sister Gertrude was 10. Their parents were Edmund Cowles Harriott and Anne Gertrude (Ryan) Harriott. 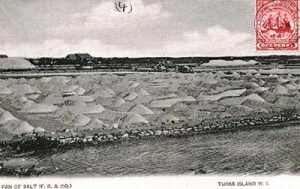 Although Edmund was born on Salt Cay, he had moved to Grand Turk by 1888. He was appointed Clerk of the Commissioner that year. At this time it is not known what other employment Edmund may have had while living on Grand Turk. Lillian’s mother, Anne or Annie, was born in Bermuda. Anne and Edmund were married in 1889 in Nova Scotia. Lillian and Gertrude moved to Jamaica about 1920. Their parents also moved to Jamaica—most likely at or about the same time. Very little is known about their life in Jamaica other than both girls married and spent the rest of their lives there. Lillian is thought to have died in Saint Andrew, Jamaica in 1976, but some sources say she died much earlier in 1924. 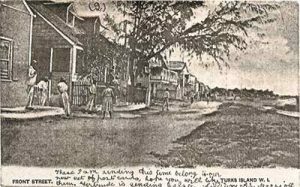 If anyone has additional information on this branch of the Harriott family, or knows who produced or published this series of postcards, please contact the author at tinqua@aol.com. The author would like to thank Tom Giraldi for providing some of the images of the postcards on which this story is based.